Below we have listed and reviewed the ten best indoor bike racks. For more information scroll to the bottom for a full buying guide. This indoor bike rack is designed to handle 2 bikes; one above the other. This makes it an excellent choice for anyone who is limited on space. The rack is slim with a simple design which will allow it to fit into virtually any environment. It is designed to handle a total of 100 pounds; ideally split into 2 bikes of 50 pounds each; although it is possible to have a heavier bike on the bottom and a lighter one on the top. The Racor rack has a solid projecting foot to ensure your bikes remain securely on the rack; not on the floor. This is accompanied by a screw fitting; allowing you to securely fasten your bikes to the wall. Each of the arms are adjustable; this allows you to mount any type of bike, male or female and still take the minimum necessary space from your room. This movement also allows you to keep the bikes level. Both the height and the width of these bars can be adjusted. 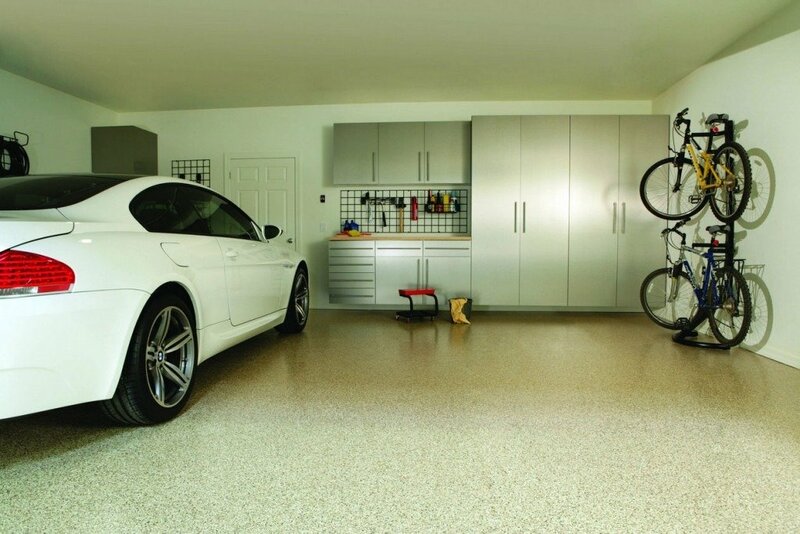 Rubber guards on the base will protect your flooring from any damage; unless you hit the walls while mounting the bike. Even the bike support arms have a vinyl coating to protect your bike from damage. The rack is available in just one color; black. But this does ensure it will blend into virtually any location. It is worth noting that, despite being made from heavy duty steel; the Racor indoor bike rack weighs just 20 pounds. It can be easily moved if you need to. Of course, you should verify that you have space where you intend to keep your bikes; the stand is just 27 inches wide and comes out 21 inches from the wall. It is 82 inches tall but you must remember that your bike needs to fit in the space around it; the alcove looks great but may not accommodate your bike. The beauty of this rack is not its simplicity; it is the fact that it can be easily moved when needed. With just one screw securing it to the wall there is minimal damage to the wall and it takes moments to locate it somewhere else. This is important as the ideal position may not be as appealing once the rack is in place. The screw is not considered to be an essential part of this rack; it is capable of standing by itself. However, screwing it to the wall will give you peace of mind and may be exceptionally beneficial if you have children in your home. It is worth noting that this rack does need to be assembled once you have received it. The rack is discreet but, thanks to the many positions the arms can be placed in; it does have a slightly industrial feel to it. That said, the rack is available for just $73.11 making it a very attractive and affordable option. The ease of use and its mobility make it one of the best contenders available on the market at this time. As you can tell, this rack is designed to hold up to 5 bikes and simply sits on the floor. In fact, in appearance, it looks very similar to many bike racks you will find provided in public places, for securing your bike while you are out. The rack itself is made of high-quality steel, it has been powder coated in silver to make it aesthetically pleasing and you may be surprised to find that it does not look as bad in your apartment as you may think. One excellent factor of this stand is the ability to separate it. It is built to hold 5 bikes but, you can remove one of the units or all of them; allowing you to store bikes in different locations or even keep racks in different places according to the places you frequent the most. The racks can be separated easily via a quick release mechanism. As they do not need to be bolted down they can be moved in seconds. Of course, it is possible to bolt the rack to the floor if required. This could be an option if you have children which are likely to move the rack or the bike; or if you are a crime hotspot area and wish to have a little extra protection for your pride and joy. The entire rack weighs just 10 pounds and is not something that most non-cycling fans would wish to have in their sitting room. It arrives in sections and can be easily put together; in the process, you will understand the quick release mechanism for taking it apart. Unlike many bike racks which have a slot for the tire; this rack is designed to handle any size and type of adult bicycle; making it an excellent choice for those with a selection of bikes for all occasions. It is worth noting that this indoor bike rack will not accommodate wheels smaller than 20 inches; this will rule out the majority of children’s bikes and makes the stand an impractical choice for families. 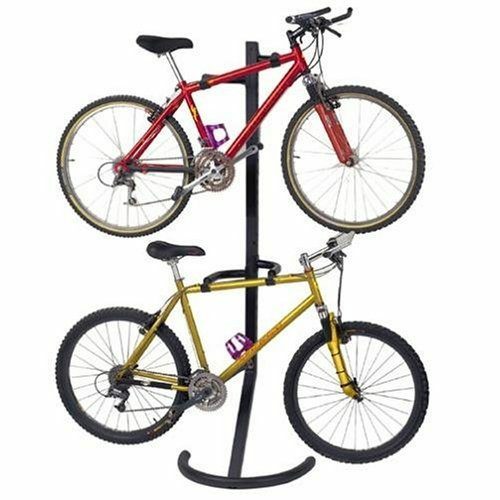 This product is available for just $39.99 which makes it one of the most affordable indoor bike racks on this list. It is possible to use it outside, although you would be advised to bolt it down due to the lightness of the rack. Its powder coating will protect it from the elements but it may suffer in high winds. You should also be aware that this rack is designed to store your bike in an upright position, but, if desired, it is possible to store them diagonally. This can be achieved by switching the left arm with the right arm when constructing the rack. This is not something that was envisioned by CyclingDeal but it is an attractive solution when space is at a premium. Unless you are an avid cycling fan this rack is best suited to your garage floor, but it can be used effectively inside the house; all you need is a little space! 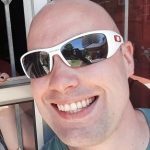 This is the second entry from Racor and is a testimony to the quality of their products. Unlike the Racor Pro PLB-2R, this offering is designed to fit four bikes. At first glance, without any bikes on, you would be forgiven for thinking this is a contemporary hat stand. However, on close inspection, it will become apparent that the industrial design and flexibility of this product have made it perfectly suited to storing your favorite bike; as well as your less favorite ones. The Racor Pro PLB-4R comes in black and is designed to be free standing. This means that you can use it virtually anywhere in your room, even in the center if you choose! The additional range of options this can provide you with in any room is staggering; it really will be possible to keep your bikes in any room of the house; or a different room every day. This indoor bike rack has been well tested to ensure it can safely support your bike despite not being secured to a wall; this is an impressive development. The rack weighs just less than 25 pounds and is 22 inches, by 32.5 inches; without any bikes on it. Its height is just 81 inches which should ensure that it will fit comfortably in any room. This also provides you with enough space to adjust the stand to fit one bike above the other; even if you are tall and your bike frames are at the top end of the scale. It is designed to handle four bikes with a maximum weight of 160 pounds, with a price tag of just $90.66 it should be a very attractive option to any cyclist. The frame is made from steel; it is tubular for additional strength and powder coated to ensure it lasts for many years. You will also be relieved to know that you do not need any tools to assemble this rack. Perhaps more importantly, the rack is exceptionally flexible. You can choose where to position the arms and mount just 1 or all 4 bikes; according to your needs. The adjustability includes making an allowance for the angle of the bike. The Racor Pro PLB-4R ensures your bike is horizontal and safely stored at all times. Each of the arms is vinyl coated to ensure your bike is protected from unwanted scratches. The base is also coated with heavy duty rubber; this will ensure your floor does not get marked. It is worth noting that the bike can be attached to a wall if required via an optional extra. However, all customer reports so far indicate that this is simply not necessary. The stand is so well balanced that it will stay upright even with 4 bikes on it. Although this indoor bike rack may not win awards at the most stylish, it is very practical and has a certain charm; which is helpful when you need to store four bikes inside your home. However, due to the size of the rack, this is a good looking way to store your bikes but not necessarily a space saver. With four bikes on it will take as much floor space as four bikes stacked next to each other; although there is less chance of damage with the rack. 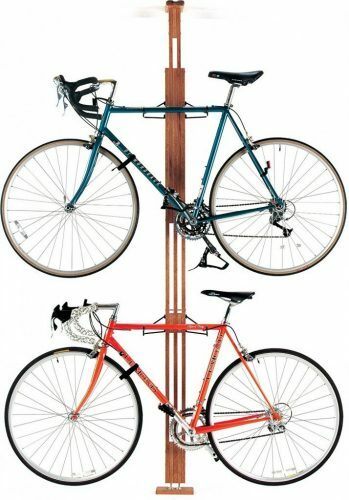 The Delta Cycle Michelangelo bike rack is designed to safely store 2 bikes in your home or garage. It has no wall attachment although it is designed to lean against the wall. This is achieved via its legs which angle out at the bottom; providing it with support even with the weight of two bikes on it. It is worth noting that this support protrudes past the bike; this is what gives it stability but can make it a trip hazard when there are no bikes on the stand. This indoor bike rack weighs just 12.6 pounds and can be assembled in just a few minutes. It is 83 inches tall, 19.75 inches wide and comes out 16 inches from the wall. Both the upward supports have hooks fastened to them to provide you with a place for two bikes to be stored. The maximum weight indicated by Delta Cycle is 80 pounds; which should be more than adequate for the majority of bicycles available on the market. The rack does require some putting together; it usesM5 bolts although all the holes and necessary fittings arrive with it. Most people can put it together in less than 15 minutes. While this rack can be used in the garage it actually seems a shame to hide it away! The rack is extremely elegant; designed to reflect the current art deco trends. This should not be surprising considering the name of the rack; it has to look good! The frame is made from tubular steel for strength but this is powder coated silver; providing just the right look and strength to hold your bikes indefinitely. It is coated with heavy duty rubber bumpers which will protect your wall and your floor from becoming damaged. Just like many of the other racks in this list, the arms can be easily adjusted to suit the type, size and even style of your bike. Whether you have a race ready bike, a mountain bike or simply need somewhere for his and her day cycles; this is the rack for you. When not in use it can be left safely leaning against the wall as an art deco ornament; you may even have people staring at it trying to figure out what it is! 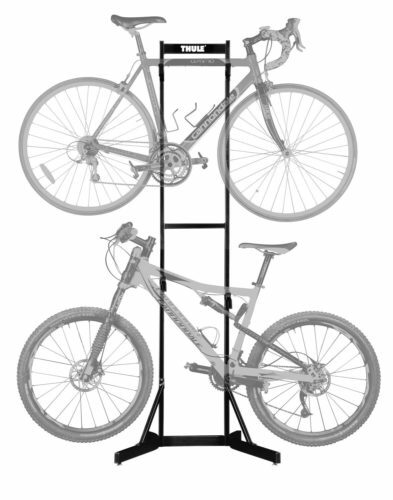 Delta Cycle has included a limited lifetime warranty with this stand; showing how confident they are in the product and justifying its presence on the top indoor bike rack list! There have been some reports of the Michelangelo falling over although the company now confirms that any issues have been resolved. However, if this still concerns you it is easy to secure this tack to the wall. The safety of your rack is then assured; providing your wall is strong enough! A final point which is worth noting, especially in the competitive world of indoor bike racks, is that the company behind this product, Delta Cycle are gaining a reputation for caring about their customers. If you have an issue with this product you can expect a prompt, friendly and helpful response. That only makes this rack a top contender! 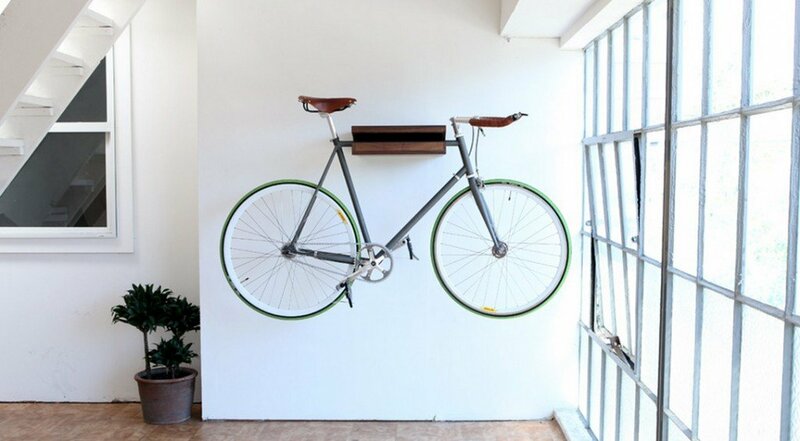 This is a small but incredibly stylish indoor bike rack. It is also unique as it incorporates an all new push design. Most bike racks involve you lifting your bike up; either onto a suspended stand or over the lip of a floor stand. However, the Bikehand floor parking rack has a tilting front stand; allowing you to slide your bike directly into the parking slot. As soon as it is in place the stand tilts against the wheel; effectively locking it in place. But this is not the only reason it is included in this list! The Bikehand rack holds your wheel in place at three distinct points; making it more secure than any other rack currently available. Clamping points lock against the tires of your bike, avoiding the risk of damaging or altering your derailleur. The lowest mounting point, which you ride into, is extra deep to ensure the bike is stable; even under pressure. Although this rack could be used by anyone it is especially beneficial to those who have heavy bikes or are unable to lift. This bike rack looks good, it is relatively discreet and can even be folded up; making it perfect for storing out of the way when not needed or for taking with you on trips; providing you are taking the car as well. 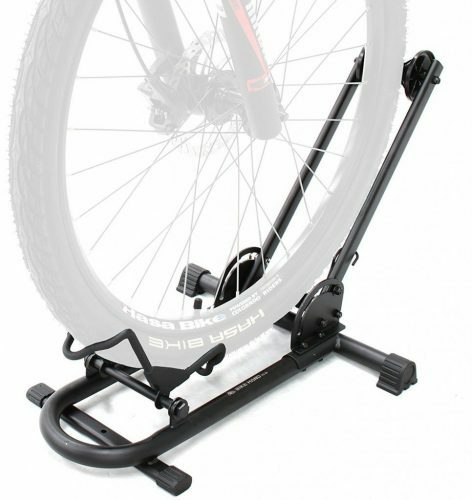 Even if you do not have a stand this rack can be used to support your bike while out and about. 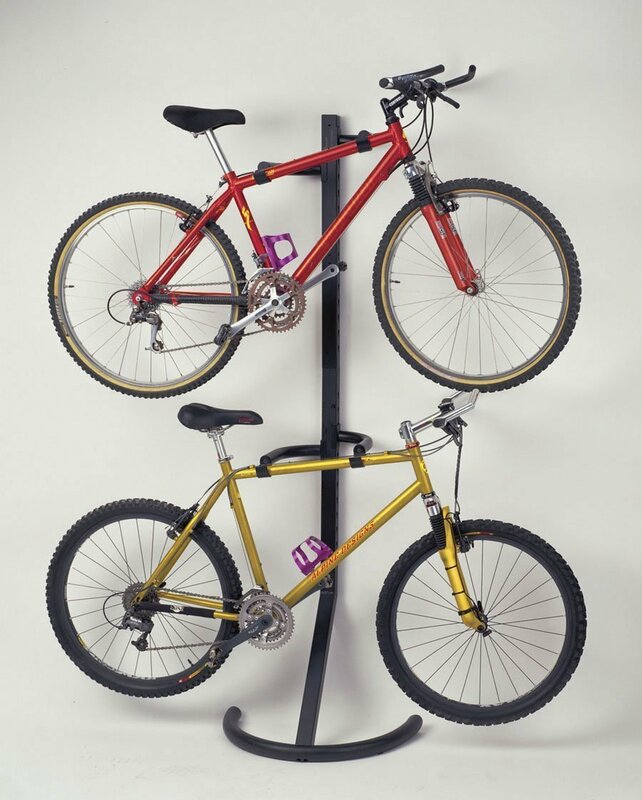 The Bikehand floor parking rack is made from high-quality steel which has been heat-treated and can be finished in virtually any color you wish. Yes, it can be done to match your bike! It is well built and the new style design is simple; helping to make sure that you have no issues with this rack for years to come. It is also designed to accept virtually any bike; as long as it is over 20 inches and the tires are not wider than 2.4”. Although this rack is small and close to the ground, you will be surprised at just how stable it makes your bike. It is virtually impossible to make it fall over; especially when exposing it to normal, everyday forces. The rack weighs just 6 pounds and is 15 inches long by 6 inches wide when folded virtually flat. At just $39.99 it could be the perfect rack for your needs. It is hard to imagine you needing anything else. It is worth noting that the rack does not appear to come with instructions on how to use. It is already made for you and operating it is simple. But if you have any queries regarding this you can easily see it in action in this YouTube video. Perhaps the most inspiring thing about this new approach to indoor bike racks is not that it is exceptionally easy to use, or that it looks good; it might just be that it comes with a lifetime warranty! That is how confident the manufacturers are in their product and why it is on this list. Gearup OakRak is made from the American red oak tree and is an all American product. It is designed to provide an effective and safe storage option for up to 4 bikes and is fully adjustable to your needs. The first thing you will realize when you see this product is that it is well suited to almost any home; the real wood sits well in contemporary houses, modern apartments, and more traditional homesteads. The rack is also adjustable. It is designed to fit rooms between with heights between 7 ft and 10 ft; effectively a one size fits all option for bike racks. It’s standard dimensions are 120 inches by 15 inches by 10 inches. It could look like an attractive post in your house or even an unusual totem pole. The wood is coated with an oil stain to preserve and protect it for years, while the oak base is designed to ensure it remains stable; even under maximum load. You can put a total of 200 pounds of weight on this rack safely. 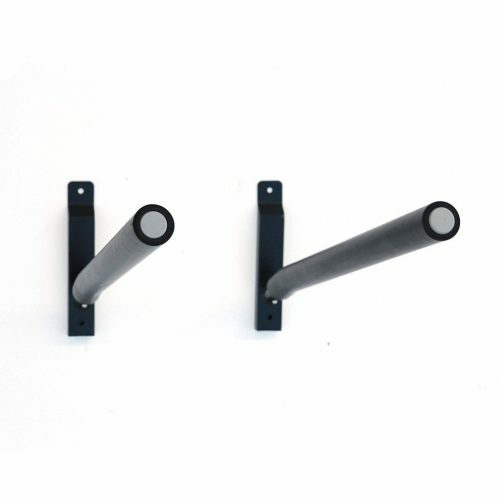 The bike holders are mounted independently; allowing you to accommodate sloping frames as well as straight ones. You can also control the height you position the bike at; ensuring they do not touch each other and are secured properly. The rack has a vinyl coating on its support arms to ensure your bike does not get damaged when lifting it on and off the rack. It also features a very useful strap which secures the wheel to your frame; ensuring it doesn’t move or get nudged while stored. When you purchase this rack, you will quickly realize that the $155.38 price tag is worthwhile. The product has been built to the best possible standards and the quality shows. It arrives with all the fixings you need to support 2 bikes but you can easily purchase extra fittings for another two bikes. In addition, it is possible to purchase accessory kits which will allow you to store your bike accessories; such as your helmet, lights and other essential devices. Although this structure is mounted from floor to ceiling it does not appear obtrusive in any room. In fact, it will add character to your home. It requires no fixings and will not leave any marks on your floor, walls or ceiling; regardless of how long you need to keep it up. Installing this bike rack is surprisingly easy. You will need to wind the inner section out until it reaches your ceiling; you will need to assemble a few of the parts before you can do this but the instructions are very easy to follow. It is advisable to install this where you know a beam exists in the ceiling. If you don’t you risk lifting the ceiling as you wind the mechanism out. You can then position all the arms where you feel they are most appropriate for your needs. This is one bike rack that really looks good in any situation; you may even decide you like it so much you need a second for your bikes! Sometimes the best approach to looking after your bike is the simplest. Stoneman have opted for this option but you will be required to mount the rack on your wall; this can be done on any wall in your garage or home but you should consider whether your wall is load bearing or not. Partition walls with dry lining may not be sturdy enough to take the weight of your bike. This bike rack is designed for just one bike, although it may accommodate 2 children’s bikes or can be adapted to allow an extra bike to hang beneath it. 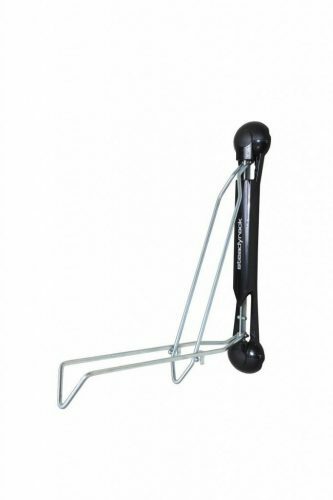 The Stoneman Sports Sparehand rack is effectively two strong bars mounted on your wall. The bars are made of heavy duty steel and powder coated in black to provide a professional, although slightly industrial finish. This finish is designed to protect your bike; you can slide the bike on and off the rack without damaging it. The finish will also prevent rust from attacking the rack. Although designed for indoor use, this rack is a very capable at being used outside; providing you cover your bikes and include a secure eyelet for locking the bikes up. Mounting the rack is very easy, although it is more challenging to adjust it when changing your bike than a standard rack. Each of the mounts can be positioned anywhere on your wall; allowing you to accommodate any style of frame. The mounts are screwed into place although the raw plugs and bolts are not supplied. You can set the mounts at different levels to ensure your bike hangs straight or that is easy to lift on and off. One feature which really separates this from simply mounting bars to the wall is that the arms can be easily removed from the brackets. If your bike will not be at home for any length of time this is an excellent idea to prevent you from walking into the mounts. The product sells for $63.88 and weighs just 5 pounds. The brackets can be mounted far enough apart to support the largest frame of bike, or, you can even choose to put your paddle boards and other water sports gear on them. In addition to supporting your bike you will find that it is easy to hang the additional bits you need each time you ride; such as your helmet. These items can be hung from the end of the mount without interfering with the bike. It is also worth noting that you can hang as many of these racks as you need, either horizontally or vertically; depending upon the space you have available. You might even find other uses for this mount which are not related to cycling and bike storage. It is worth noting that each of the bars is 27 inches long; this makes the mount large enough to support any bike without needing to turn the handlebars. However, you may wish to consider adding a strap to hold the bike in place and putting some cushioning material against your garage wall; to ensure your bike does not become needlessly damaged. At first glance, the Steadyrack classic looks like the frame of a golf caddy. However, this is actually a sophisticated bike rack; providing excellent value for money and looking good in the process. The bike rack is designed to be used on the wall; you drive your tire into it and, providing it is not wider than 2.2 inches, it will be held securely; preventing your bike from falling over. If your tire is wider than 2.2 inches you will not be able to fit it into this rack! The rack is currently available at $69.99; the quality of the materials used in its production make it worth every cent. It will last for many years with minimal or no maintenance. A Steadyrack classic is not your traditional wall mounted bike rack; it makes your bike look good, (or better than normal). The rack is mounted so that you drive your tire up the wall and into the mount. This then locks it into place and leaves your bike mounted vertically, against the wall. It is worth considering this point as, while it looks good, in order not to lift your bike it will need to be pushed against the wall: it may not be something you want to keep in your living room. You can see an example of the rack being used here. You will note the video shows the tires never touch the wall, however, if you slip or are feeling weak then this could become an issue. 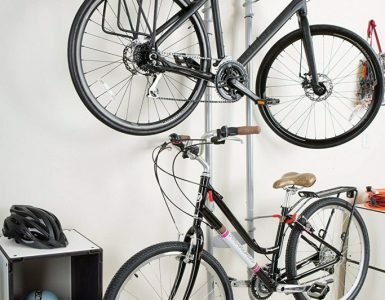 The rack is also designed to allow you to fold your bike sideways; against the wall; this will make it take up less of the physical space in the room but potentially increase the chance of damaging the wall. For this reason, the Steadyrack bike mount is probably best suited to your garage or other outbuilding. It is an ingenious solution to the storage of your bike. The rack can be mounted in a matter of minutes; it is bolted to the wall at the top and the bottom. You will need to ensure the mount is straight and that you are securing onto a load bearing wall or the stud of a partition wall. Dry lining alone will not support the weight of your bike. Once you have mounted the main mount you will need to hold your bike n position while you mark where the lower mount should go; and then secure it. The Steadyrack Classic weighs just 6.5 pounds and folds almost flat; making it easy to carry and safe when your bike is out. The entire mount is just 25 inches by 22 inches by 5 inches; making it small enough to fit virtually anywhere in your garage. You can then simply lower the clamping mechanism and drive your tire in whenever you need to. 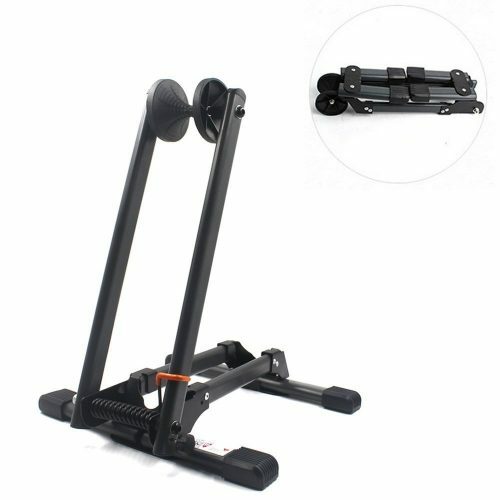 Because you need to do all the lining up yourself when installing this, you will be able to set it in the perfect position for each of your bikes; making this an excellent way to customize your bike stand. Thule is one of the most famous names in the mounting industry. They already have roof boxes and a variety of wall mounting systems for virtually any need. It is hardly surprising that they have a bike rack worthy of inclusion in a best 10 list! The Thule BSTK2 is a free standing rack which is stylish enough to look at home in your sitting room. You can, with a little imagination, see it being used for a variety of different purposes. This is a well-designed bike rack which will hold 2 bikes securely and does not need to be fastened to any wall, floor or ceiling. The base protrudes on both sides to provide it with stability; even when you mount the 2 heaviest bikes you can find. These legs are covered with thick soft rubber to ensure your floor is protected from any marks. Of course, as with most indoor bike racks, it is not possible to prevent your carpet from becoming indented by the rack if it stays in one place for an extended period of time. The Thule BSTK2 has two sets of arms which can be moved to accommodate your specific bike. This includes being able to set the arms at an angle for women’s bikes; allowing them to sit straight. You can place the arms at any height to allow for children’s bikes and even tall parents. The stand is made from 2-inch heavy duty steel; this is what makes it so strong and cable. It is 84 inches tall by 31 inches wide and 21 inches deep. This depth is important to ensure you can mount your bike without needing to have the front wheel at an angle. It comes in just one color; black and weighs 28.8 pounds. The bars are actually V-shaped this helps to ensure your bike stays on the rack and is not the victim of an unfortunate accident. Although you can tie your bike to the rack this makes it much less convenient when you wish to use it. The Thule indoor bike rack currently sells for $179.95; although more expensive than some of the other racks in this list, this is a premium product and the price reflects the quality you are getting. There is a small amount of assembly required when you first receive your bike rack, but the detailed instructions will ensure it is ready to go in no time; allowing you to focus on the ride. Another attraction of this rack is that it can be incorporated into virtually any room; regardless of the height. Even if your room is only 7 foot tall you will have enough space for this stylish and useful rack. Thule has a reputation for quality and this product does not let them down. It comes with a comprehensive manufacturer warranty and excellent customer service should you have any queries or issues. The one point of issue that is worth noting is that you cannot move this rack by simply grabbing the bars. You will be holding the top half of the rack which literally lifts off the bottom. To move the Thule indoor bike rack you must grip it at the bottom. Bike racks are becoming more stylish and more innovative. This offering from Innerneed Pro offers a stylish and easier to use solution for storing one bike in your home or garage. It is designed to be used with bikes in the 20-inch to the 29-inch range; which covers children’s bikes from the age of approximately 10 to virtually every adult bike on the market. The frame is black, allowing it to be discreet in your home; especially when not in use. This is aided by the fact that it can fold almost flat. This makes it easy to take with you if needed or simply to leave it out of harms’ way until your return. This is something that should never be overlooked if you have children in your home. You can purchase one of these for just $35.99; making it one of the cheapest in this review, and yet still an effective solution to your bike storage issues. It weighs just 6 pounds and measures 18 inches by 7 inches by 4. You can store it virtually anywhere! Storing it is also very easy thanks to the clever design; simply pull one knob and it will fold up; providing the bike is not in it. The bike rack is made from high-quality steel which has been powder coated and heat-treated to ensure it lasts for a long time. The quality of the workmanship is obvious and the mechanism works smoothly. It is not likely to need any maintenance for many years. You will, of course, need to accept that it comes in just one color; black. This is true for so many of the bike racks currently available. To operate you simply push your bike into the slot. It will grab your bike and hold it firmly while tilting the mechanism to ensure it cannot come back out by accident. The device has a spring loaded arm which captures the bike wheel and helps to lock it into position. This second arm also helps to ensure the stand is stable; no matter how heavy the bike. It will not fall under reasonable pressure. 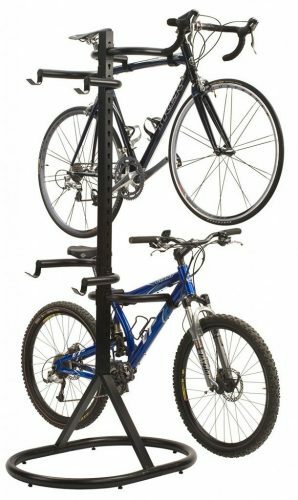 This bike stand is unique in that it offers the stability and ease of use that many fully enclosed bike racks give you, yet in manages this is a virtually open mounting. Using this will stop the handlebar marks appearing against your wall; you will even be able to locate your bike safely in the best possible place for you to use it. This mount is designed to be used with your front or back wheel; although it grabs your tire it does not interfere with disc brakes or even your gearing. It is also worth noting that you can actually clip two or more of these bike racks together to allow you to store numerous bikes next to each other. This makes them a more stylish and practical option for the traditional floor standing bike racks. It is well worth purchasing; particularly considering the price and ease of use. When it comes to indoor bike racks there aren’t really any rules stating how they should or shouldn’t look, so ideally you should look for something that is going to match your decor. If you just want a nice rack to store your bike in the garage without fear that it is going to fall over or get hit by your car, you don’t have to worry too much about the style. But, if the bike is going to be hanging on your living room wall, you might want to consider something elegant that will match the rest of your decor and which won’t irk anyone that you are sharing your living space with. A proper indoor bike rack is not only a space saver but great for avoiding mishaps that occur when a bike is just left leaning against a wall indoors. It keeps your bike safe from scratches and dents (provided you mounted everything properly of course!) and gives you peace of mind that your bike is out of harm’s way. Before buying the first indoor bike rack that you see, first, assess your home to determine what is going to fit and where it will fit. I also suggest discussing your plans with your spouse as she might have other plans for that comfy corner or prime section of wall that you had your eyes on. Now that you know the various different types of bike racks available and can see/review the best ones available on the market, it is important to understand the right approach to buying your bike rack. This will ensure you purchase the best one for your needs. This guide has informed you about the different types of rack available; some may appear more stylish than others but style, although important, is not everything. The space you have available, your current physical condition and even the other members of your household should influence the type of rack that is most suited to your home and lifestyle. It can be easy to forget this when looking at all the different racks and getting excited about specific features. However, knowing which type of indoor bike rack best suits your needs is essential to choosing the right one. The majority of bike racks are created to minimize the disruption to your home and prevent you from using too much space when storing your bike or bikes. However, this does not mean that you can purchase the rack you like the look of the most. In general, people choose to use a bike rack as they either do not have the space to keep the bike outside or they are tired of the walls and/or the bike being damaged. Having decided to purchase a bike rack you will need to think about the space you have available. No matter how compact the bike rack, your bike will still need enough space to sit in it. This means if you have very limited space you will need to consider using the walls and hanging bikes vertically, above each other. The higher you mount the bike the less intrusive it is in your living space; although it can make the room feel more confined. You should also look at the ease of access. If it is a real chore to get your bike on and off its storage rack then you are likely to use your bike less. This is not a desirable option! It is also worth considering the space you live in the most, although you may prefer to have the bike out of sight while enjoying your evening television; the space taken away in your main room will probably affect your movement around your home less than keeping it in the hallway. Even if you are locating the rack in your garage you will need to consider how much space you have spare and how many bikes you need to store. It is, of course, important to consider your budget. There is little point in choosing a fantastic indoor bike rack if it is twice the amount you have to spend. As you will have seen from this review, the best indoor bike racks do not have to cost a fortune; there is merit and practicality in all manner of designs. 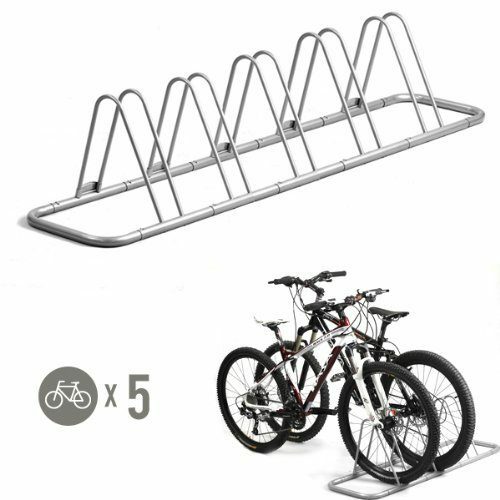 Therefore, before you even look at a bike rack you must consider the funds you have available to purchase a bike rack with; then select one that is within your budget. If your budget is limited you can choose to wait to get the right bike rack. Alternatively, you may find that your housemate is amicable to a bike rack that gives them the option to store a bike; now or in the future. This can half the cost and make even the most expensive ones affordable. When buying anything it is worth looking at the reviews. An excellent starting point is this review. However, you should also look at reviews written by people with these actual products. The best place to do this is on sites like Amazon; where you can see what people have to say after buying the rack. You can also look at social media sites and customer forums; they will all provide genuine feedback which can help you make the right decision. Statistics show that 90% of people are influenced by the reviews they read online. You need to be one of the 90%. There is a simple reason for this; despite the fact that people will often be quicker to leave negative feedback than positive; the overall feel of reviews should show whether the product is worthwhile and fit for the purpose you wish to use it for. This is exceptionally important when reviewing indoor bike racks, you will need to know that they offer your bike the protection that the adverts say they do. People with personal experience can confirm this. Reviews can also steer you towards the right retail outlet. It might be that a product is excellent but the service from one particular vendor is terrible. Reading reviews will help to ensure you choose the right bike rack and purchase it from the best place. Did you know that two-thirds of the internet users in the EU shopped online during 2016? This statistic highlights the increased popularity of the web. However, this is not the only way to purchase something and it is worth considering all your options. Generally speaking, internet retailers can sell you the product cheaper than a high street store; they have much fewer overheads. Unfortunately, it can be much more difficult to deal with an online retailer if you have a fault or complaint with the bike rack. If you have done your research and read the reviews this may not be an issue. However, it is always worth considering what companies may be selling the same bike rack locally and how much the difference in price is. The advantage of a local retailer is being able to visit them and negotiate with them. This can often make you feel more comfortable; especially when making a high-value purchase. You should be aware that you have the same rights when shopping online as when in a high street store, in fact many web sites offer better protection. But, this does not stop you from checking the market out before you decide where to buy it. This will ensure you are happy with the product and the service for the long term. Every bike rack in this best of guide provides rubber or nylon protection as standard to ensure your bike is not damaged while on the rack. It is important to consider this and look at each bike rack according to where you intend to locate it and how easy it will be to slide the bike on and off. The higher the bike rack the more likely it is you will damage your bike or the wall. You should look at the protection being offered by the various indoor bike racks to ensure your bike will be well looked after. Another factor which is important to consider is that you may not be the only one using the bike rack. If your rack can handle 2, 3 or even 4 bikes it is unlikely that you will always be the one loading and unloading the bikes. You must, therefore, consider the potential for others to damage your bike when lifting theirs on and off. Your choice of bike rack should reflect this important element. It is unlikely that everyone in your household will feel the same way about your bike, or bikes as you do. This means you need to consider where your bike rack should go in relation to their activities. The most desirable place may be somewhere where the other members of your household spend a lot of time. By considering their needs and the traffic passing through each room you will be able to work out the best place and one that will not cause friction with other. This can actually be a good opportunity to introduce them to cycling or to encourage them to use their own bike more; simply make sure your stand will take their bike as well as yours. The added bonus is that it will be harder for them to complain about the indoor bike rack if their bike is also on it. Of course, if your family or roommate is also mad about bikes this will not be an issue! The prices of indoor bike racks obviously depend on how elaborate the actual rack is, what material it is made from and how sturdy it is. The type of indoor bike rack you choose will also determine how complicated it is to assemble and set up. The process can range from being as simple as screwing a frame to a wall to opening a bag and being showered in slide nuts, screws, star washers, Velcro and more! Fortunately, you will usually find an instruction manual in the box to help you piece together your new kit. If all else fails there is always instructional videos on the Internet that will teach you the ropes if you opted for one of the more widely known and available racks. As you can see there are plenty of options to choose from so don’t rush your decision and end up with an indoor bike rack that doesn’t match your home. If your bike is important enough to you to keep indoors it is important enough to warrant an investment in a proper bike rack. Choose one from this list and you will not go wrong. Having a bike rack may not seem a necessity but if you are someone who uses their bike regularly then it will make your life easier. It doesn’t matter if you live in a mansion or a one roomed apartment; a bike rack will do more than keeping your bike safe from thieves; it will protect it from accidents in the home, allow you to keep your space tidy and always have your bike accessible. Most importantly you will always know where your bike and your accessories are. You should be able to choose a bike rack from this list and follow the steps given in this guide to find the perfect indoor bike rack for your present needs. However, remember that this does not mean it will always be the best bike rack for you; times and locations change. The best indoor bike racks can be easily stored or reduced in size to avoid the possibility of injuries. This is one of the reasons why it is best to purchase a purpose made bike rack rather than attempt to build your own. It can be very frustrating, and painful when you have walked into the protruding part of your bike rack for the third time in one day! With your bike rack chosen and your bike safely secured you can focus on actually using the bike or bikes. Whether you enjoy gentle rides with the family, training for race day or just the freedom of the road; your bike is an essential tool and part of your life. If you look after it then it will look after you. The best way to start this process is to find the right bike rack and store your bike in an appropriate indoor bike rack. Take your time to choose the right bike rack; it will be your friend for a long time to come. The Racor Bike Rack Pro is a sturdy freestanding bicycle garage storage rack which conveniently stores two bicycles in a small space.